The TIMS recording solution has been designed for speech pathology to simplify the video capture and archiving of your MBS/VFSS sequences. With TIMS you have full control over what you send to your PACS archiving system. We give you the ability to view your acquired images in full HD and edit out any extraneous images or streams that you do not want to archive. TIMS is the only system available which is capable of capturing a full video streaming study from any medical imaging modality, editing within your office and saving relevant images to PACS. Watch the TIMS overview and demonstration Video. TIMS can be an essential tool in any department that uses diagnostic imaging – Radiology, Cardiology, GI, Urology, Endoscopy, Dermatology, Pathology, Motion X-ray, and more. TIMS can convert any non-DICOM modality to DICOM and then connect it to the PACS, or TIMS can simply connect a DICOM ready modality to the PACS thereby eliminating any destination charges from the modality vendor. Many of our customers appreciate TIMS intuitive interface and useful editing feature. Because TIMS is a compete workstation, a technician is able to review and edit out extraneous images prior to sending to PACS. This assures that the radiologist only sees the views that are pertinent to the clinical diagnosis. Replace your outdated, low-quality DVD-video & video tape systems and upgrade to high resolution, DICOM, instant access, & syncronised audio with TIMS. TDRS is a software-only version of the TIMS system (no video acquisition hardware). TDRS can be installed on any Windows 7 or Windows XP computer in the speech pathology lab, office area, or anywhere in the hospital. To speed workflow and immediately free up the fluoroscopy suite for the next patient, the speech study can be instantly sent over the hospital network from the TIMS system in the fluoroscopy suite to one or more TDRS systems throughout the hospital. Speech pathologists can then edit, annotate, review, andanalyze the studies, free from the pressure of creating a bottleneck in the fluoroscopy suite, in the comfort of their own office or lab area. The number of applications for TIMS is nearly endless. TIMS can be an essential tool in any department that uses diagnostic imaging – Radiology, Cardiology, GI, Urology, Endoscopy, Dermatology, Pathology, Motion X-ray, and more. Our customers are finding new ways to use TIMS almost every day. In fact, the current TIMS version that is available today is a direct result of the customer feedback that we have received over the years. We listen to our customer’s feature requests and do our best to implement them in future releases. TIMS has evolved as our customers needs have evolved. “TIMS is by far the leader in the medical imaging industry when it comes to capturing still and motion video studies. 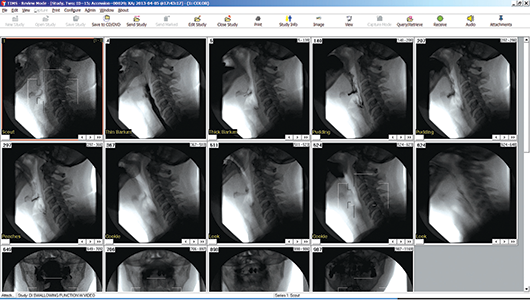 Because of its unique streaming capabilities, many of our diagnostic imaging customers are utilizing TIMS for all of their motion procedures such as: angiography, fluoroscopy, nuclear medicine and ultrasound procedures, barium swallows, catheterization procedures, and others. Don’t be fooled by other DICOM conversion boxes that claim to capture streaming video, but in fact can only capture mere seconds of a study. TIMS is the only DICOM conversion system available today that is capable of capturing an entire study to be sent to a PACS or other archiving system”.